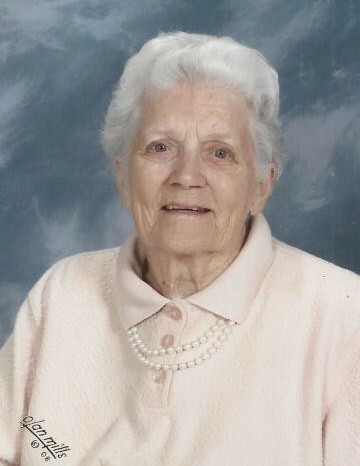 Obituary for Mary Kathleen (Coulter) Quinley | Koller Funeral Home, Inc.
Mary Kathleen Quinley of Roxborough, Phila., PA, 11/29/18 at age 99. The daughter of the late Fanny Jane and Andrew Coulter of Inver, Donegal, Ireland, Mary was predeceased in death by her husband, Harry I. Quinley; a brother, Edwin S. Coulter of Inver, Donegal, Ireland and sisters, Ella Bustard of Blackwood, NJ, Frances Hoare of Kent, England and Dorothy Mitchell of Londonderry, Northern Ireland. During World War II, she voluntarily joined the Woman’s Land Army in Kent, England where she helped train new members in Dairy Farming for four years. She came to the United States of America as a GI Bride where she and Harry became parents of four daughters who survived her, Hilary Miller, June Topa, Kathleen (Jim) Bateman and Dawn Winters. She is survived by her sister, Myrtle (Bill) Moore, many grandchildren, great-grandchildren and great-great grandchildren. Mary proudly became an American citizen in 1949, but never lost her love for the land of her birth. In Roxborough, she founded and was Director of the Senior Citizens Club for the Salvation Army for 21 years. She was an active member of the Leverington Presbyterian Church as Deacon, Choir Member, Martha Circle and Bible School Teacher. In Virginia Beach, she was a member of the 1st Presbyterian Church and was involved with Presbyterian Women, Stephen Ministries, Sunday School Member and an active resident of Sullivan House. Relatives and friends are invited to a Celebration of Mary’s Life on Sunday, December 9, at 3:00 pm at Leverington Presbyterian Church, 6301 Ridge Avenue, Phila., PA, 19128. In lieu of flowers, donations may be made to Leverington Presbyterian Church, The Salvation Army, 6730 Ridge Avenue, Phila., PA 19128 or give to The Salvation Army Red Kettle when you see one and think of her fondly.